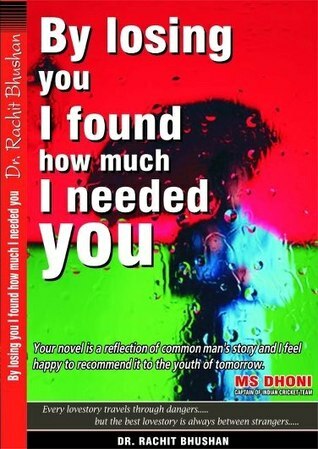 By losing You I found how much I needed You’ by Dr Rachit Bhushan VERY EMOTIONAL, HEART TOUCHING ENGROSSED WITH FEELING OF LOVE ….This is the debut novel by Dr Rachit Bhushan.. and when I got my copy of his book I was not able to hold myself to start with the journey of “Rachit n Pari”.This is a story about two strangers, a journey of ‘Rachit & Pari’, ., who met as acquaintances in ‘Rachit’s sister marriage but happen to fall in love….. their love was so passionate so innocent, they were by each others side in all thik & thins of life..till they part . Dr Rachit Bhushan, who is a doctor turned writer has been felicitated by the Indian Medical Association for his book and his novel also is recommended by the cricketing maestro Mr. M. S. Dhoni.The story of Rachit and Pari moves further with different twists and turns by virtue of destiny in it….to know how and what one has to read ‘By losing You I found how much I needed You’.Now my Positive viewpoints:This is the debut novel of Dr Rachit Bhushan whose tagline is this book is not a chick lit love story or a Mills and Boons romance. It is a relation between two strangers who never meet in their whole life, yet they possess a beautiful bonding between them. Dr Rachit Bhushan has done a good job and justification to this love story. I just loved the way he has mentioned his characters (Rachit’s parents, his sister, his friends, Pari’s family and friends Rads and all) which seem lively enough. He has explained the beauty of Nepal so well that it seems flashing in front of readers while reading the book. Also he has explained the practicality of the metropolitan cities very well and the nature of people out here.., as some are really helpful and some will be just acquaintances, nothing more then that. He has explained the chemistry, the bonding between ‘Rachit & Pari’ really well.The way ‘Rachit & Pari’ used to talk on phone without the knowledge of their parents and the way they have sent gifts to each other on their birthdays was so very romantic. The problems faced by Rachit during his medical training and the way Pari has always supported and guided him, shows her caring nature towards him. These are some indescribable feelings.Indeed I would agree with MS Dhoni (Captain of Indian Cricket Team), this book is a reflection of the common man’s story. This story of Rachit & Pari has been described very beautiful and emotional. I really felt miserable when Rachit got his leg fractured. This a sweet, romantic love story of Rachit & Pari but has a tragic end to it ,and only the day when Rachit would meet Pari probably then the unanswered questions will be answered.Some suggestive points:Although the book’s end shows a different aspect of Life & Love which is a tragedy … in general a reader always expects a happy ending or a settled future for both, in their respective lives.. I would Like to state few more things as a bit of synchronization need to done, because on some places a reader is taken back in flash back of the story which is Rachit’s childhood, his school days, and immediately in next chapter Rachit is talking about his current state in his life. These things makes a reader lose his/her interest in book. A bit of flow of the story needs to be taken care. Also a little stringent proof reading is required. But these are just suggestions….Final words:Overall if asked I would say...this is a good job done by Author (Dr Rachit Bhushan). By Losing You, I Found How Much I Needed You........! !A love story of a Doctor who writes more thanpriscriptions.... The novel moves round a boy who isvery shy and hardly talk to any girl. And then camethe turning point in his life when his eyes met a girl inhis sisters marriage n his heart starts beating for her.....Story is of two strangers who love each other and areinto a relationship for 2 yrs without even meetingeach other..... A novel which talks abt hw RachitBhushan became a doctor. His childhood and collegephase is actually we can very well connect to our own life. One can easily connect the novel to his/herlife directly or indirectly.....! !The difficulties or stroms tht come to his way.A Very Good Attempt by Mr. Doctor and a must read novel.Grab your copies Now....!! If one ignores the flaws in the english language, this book leaves you feeling good. Its like listening to a good friend narrate a life story. Rachit is a great story teller that doesnt allow you to keep the book down. He is pristine and unpretentious in his delivery. I liked the hindi oneliners throughout. am really amazed for i read it to fast................its relly a nice bookkkkkkkkkk a heart breaking true tale.